the whole history (and artistic level) of rock & roll songwriting would have been much poorer without him. Like Brian Wilson said, he wrote "all of the great songs and came up with all the rock & roll beats." 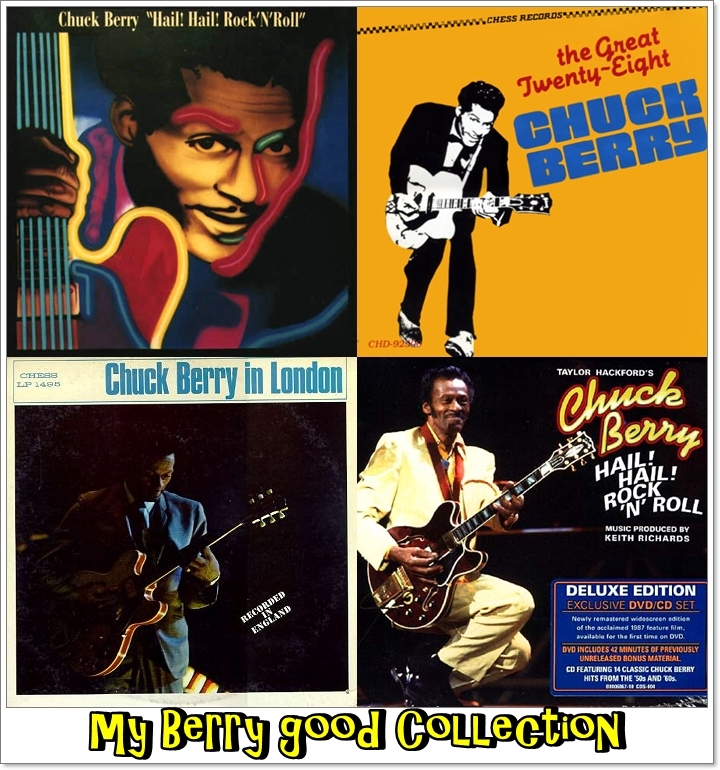 Chuck Berry was its heartbeat . He was born Charles Edward Anderson Berry to a large family in St. Louis. A bright pupil, Berry developed a love for poetry and hard blues early on, winning a high school talent contest with a guitar-and-vocal rendition of Jay McShann's big band number, "Confessin' the Blues." 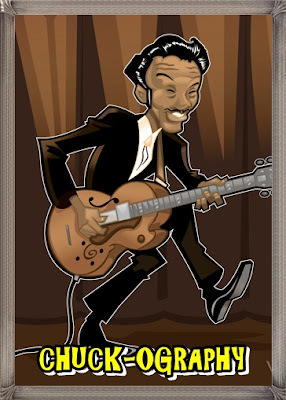 With some local tutelage from the neighborhood barber, Berry progressed from a four-string tenor guitar up to an official six-string model and was soon working the local East St. Louis club scene, sitting in everywhere he could. 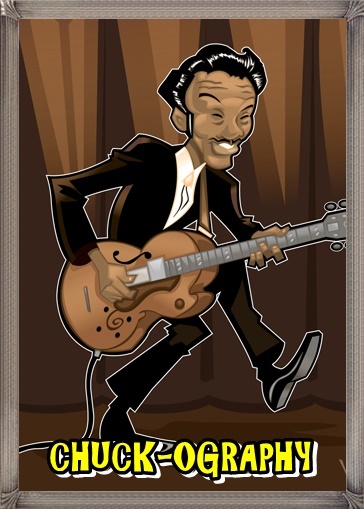 Was the sight and sound of a black man playing white hillbilly music, and Berry's showmanlike flair, coupled with his seemingly inexhaustible supply of fresh verses to old favorites, quickly made him a name on the circuit. 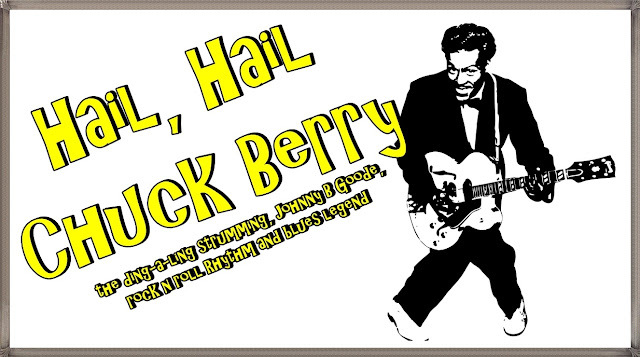 In 1954, he ended up taking over pianist Johnny Johnson's small combo and a residency at the Cosmopolitan Club soon made the Chuck Berry Trio the top attraction in the black community. But Berry had bigger ideas; he yearned to make records, and a trip to Chicago netted a two-minute conversation with his idol Muddy Waters, who encouraged him to approach Chess Records. Upon listening to Berry's homemade demo tape, label president Leonard Chess professed a liking for a hillbilly tune on it named "Ida Red" and quickly scheduled a session for May 21, 1955. During the session the title was changed to "Maybellene" and rock & roll history was born. Although the record only made it to the mid-20s on the Billboard pop chart, its overall influence was massive and groundbreaking in its scope. 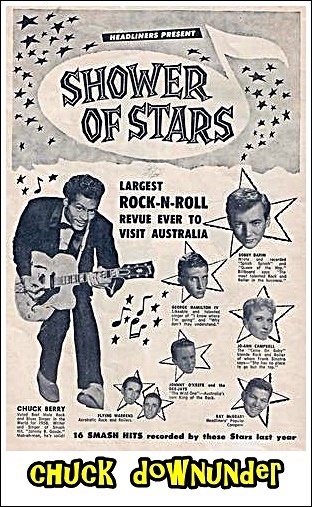 Here was finally a black rock & roll record with across-the-board appeal, embraced by white teenagers and Southern hillbilly musicians (a young Elvis Presley, still a full year from national stardom, quickly added it to his stage show), that for once couldn't be successfully covered by a pop singer like Snooky Lanson on Your Hit Parade. Part of the secret to its originality was Berry's blazing 24-bar guitar solo in the middle of it, the imaginative rhyme schemes in the lyrics, and the sheer thump of the record, all signaling that rock & roll had arrived and it was no fad. Helping to put the record over to a white teenage audience was the highly influential New York disc jockey Alan Freed, who had been given part of the writers' credit by Chess in return for his spins and plugs. But to his credit, Freed was also the first white DJ/promoter to consistently use Berry on his rock & roll stage show extravaganzas at the Brooklyn Fox and Paramount theaters (playing to predominately white audiences); and when Hollywood came calling a year or so later, also made sure that Chuck appeared with him in Rock! Rock! Rock!, Go, Johnny, Go!, and Mister Rock'n'Roll. 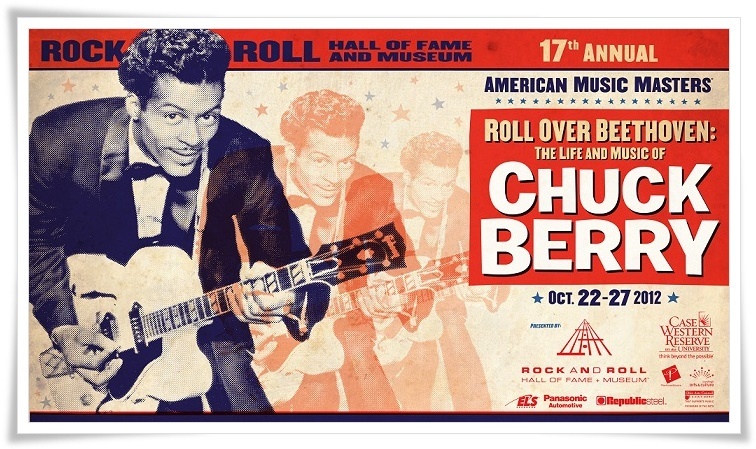 Within a years' time, Chuck had gone from a local St. Louis blues picker making 15 dollars a night to an overnight sensation commanding over a hundred times that, arriving at the dawn of a new strain of popular music called rock & roll.....The hits started coming thick and fast over the next few years, every one of them about to become a classic of the genre: "Roll Over Beethoven," "Thirty Days," "Too Much Monkey Business," "Brown Eyed Handsome Man," "You Can't Catch Me," "School Day," "Carol," "Back in the U.S.A.," "Little Queenie," "Memphis, Tennessee," "Johnny B. Goode," and the tune that defined the moment perfectly, "Rock and Roll Music." 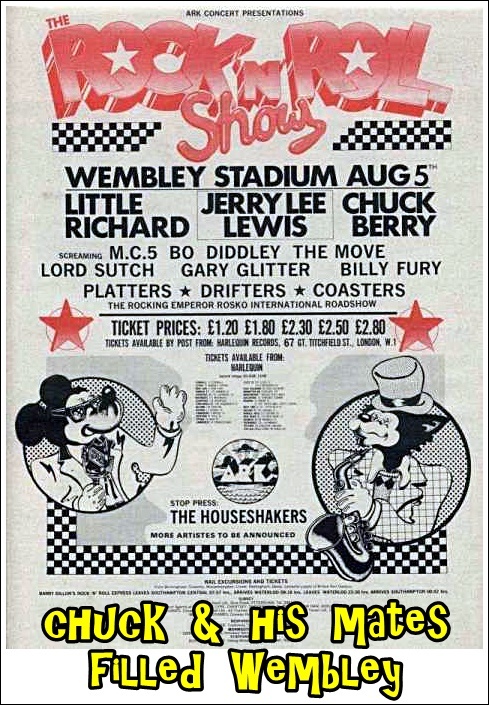 Berry was not only in constant demand, touring the country on mixed package shows and appearing on television and in movies, but smart enough to know exactly what to do with the spoils of a suddenly successful show business career, it was after this that Chuck spent a couple of years doing time... two very important things had happened in his enforced absence. First, British teenagers had discovered his music and were making his old songs hits all over again. Second, and perhaps most important, America had discovered the Beatles and the Rolling Stones, both of whom based their music on Berry's style, with the Stones' early albums looking like a Berry song list. 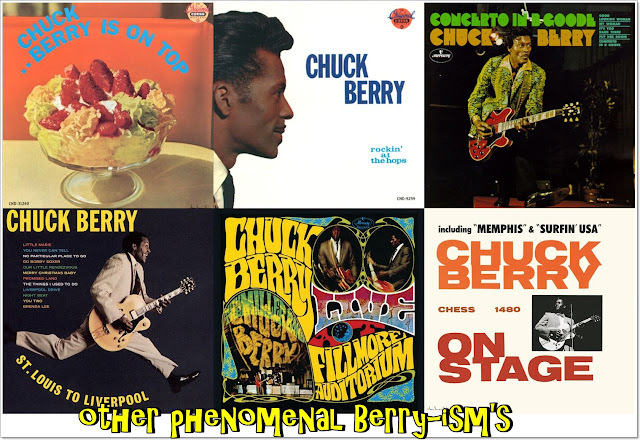 Rather than being resigned to the has-been circuit, Chuck found himself in the midst of a worldwide beat boom with his music as the centerpiece. He came back with a clutch of hits ("Nadine," "No Particular Place to Go," "You Never Can Tell"), toured Britain in triumph, and appeared on the big screen with his British disciples in the groundbreaking T.A.M.I. Show in 1964.
he returned to Chess in the early '70s and scored his last hit with a live version of the salacious nursery rhyme, "My Ding a Ling," yielding Berry his first official gold record. By decade's end, he was as in demand as ever, working every oldies revival show, TV special, and festival that was thrown his way. But once again, troubles with the law reared their ugly head and 1979 saw Berry headed back to prison, this time for income tax evasion. 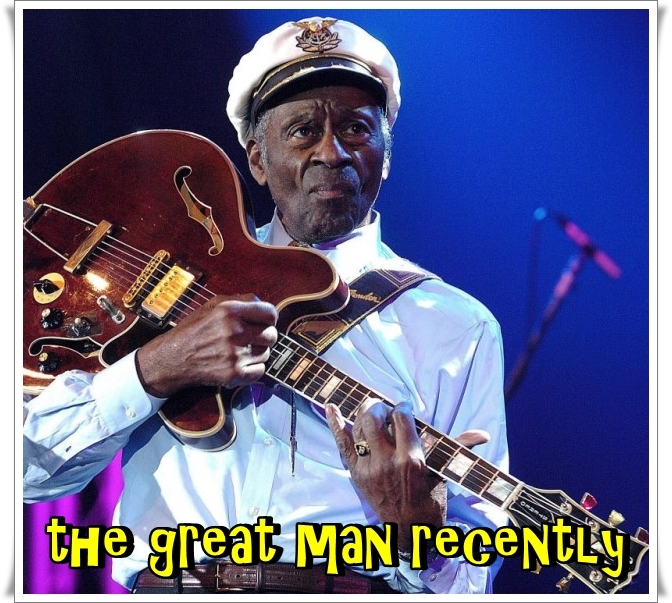 Upon release this time, the creative days of Chuck Berry seemed to have come to an end. 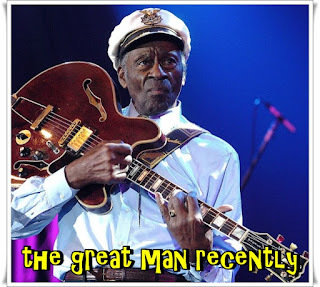 He appeared as himself in the Alan Freed bio-pic, American Hot Wax, and was inducted into the Rock & Roll Hall of Fame, but steadfastly refused to record any new material or even issue a live album. 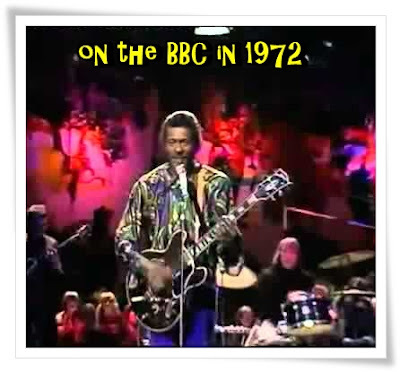 His live performances became increasingly erratic, with Berry working with terrible backup bands and turning in sloppy, out-of-tune performances that did much to tarnish his reputation with younger fans and oldtimers alike. 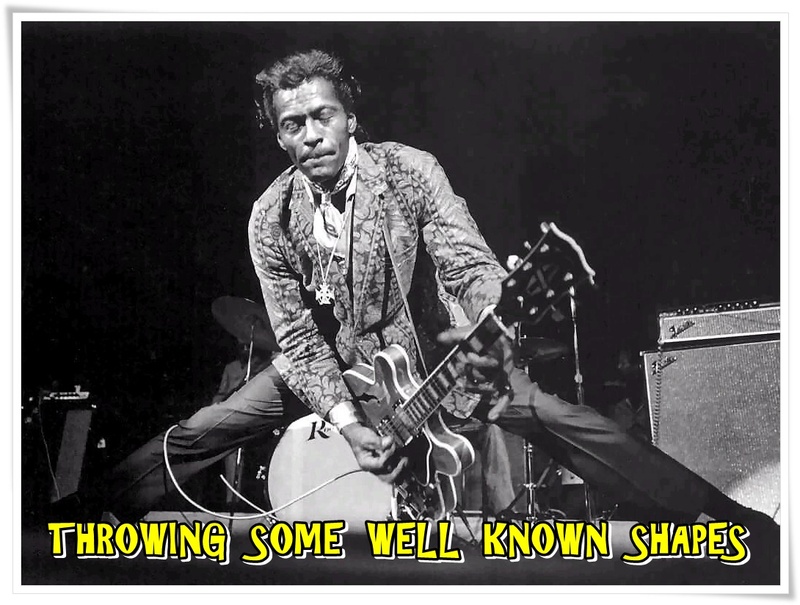 In 1987, he published his first book, Chuck Berry: The Autobiography, and the same year saw the film release of what will likely be his lasting legacy, the rockumentary Hail! Hail! 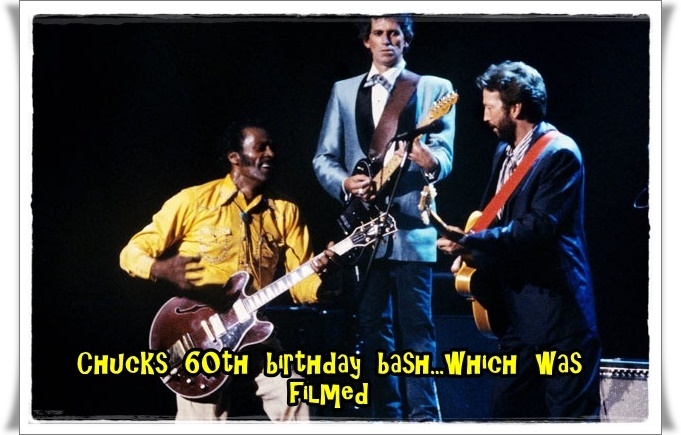 Rock'n'Roll, which included live footage from a 60th-birthday concert with Keith Richards as musical director and the usual bevy of superstars coming out for guest turns. But for all of his off-stage exploits and seemingly ongoing troubles with the law, Chuck Berry remains the epitome of rock & roll, and his music will endure long after his private escapades have faded from memory. 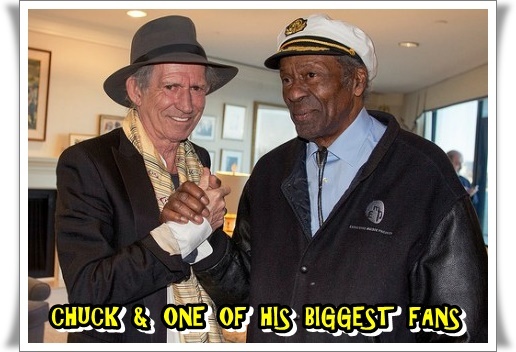 Because when it comes down to his music, perhaps John Lennon said it best, "If you were going to give rock & roll another name, you might call it 'Chuck Berry'."